Home »Comics»Deadshirt is Reading: Transformers, ROM, and Black Panther! Deadshirt is Reading: Transformers, ROM, and Black Panther! Everybody got that? Good. One of the undercurrents of fan response to Season 2 was that something had been lost after Season 1. Roberts has always been a user of labyrinthine plotting, Doctor Who-style MacGuffins and deus ex machina, and slightly misleading foreshadowing, but Season 2 seemed to turn up the volume on his idiosyncrasies. While Season 2 has produced some of the greatest comic books I’ve ever read, I have to confess that this is not one of them, and, as the finale, this does bring Season 2 down a tick for me. The issue’s just a little bit too clever by half, precluding my usual MtMtE whipsawing between weeping and screaming at the page. It wastes pages (this is surprisingly NOT a double-length issue) clarifying the motivations of an off-panel character, having Rodimus, Ratchet et al. comment on the action panel by panel while expositing how it is possible, and bookending various bits and pieces from the first issue of Season 2 (MtMtE #28). The meat of the issue—the conflict between Megatron and his protege Tarn—is crowded out by trivia. You’ll notice I’m kind of talking around the story, which is almost impossible to discuss without spoiling rotten as it is structured around a series of trapdoor reveals. There’s also very little that means anything to someone who doesn’t follow the comic already. The philosophical statement I hailed in #54 is muddled. There’s a compelling concept here that Megatron is such a genius that he actually plans ahead for various psychological states he might find himself in. However, with the issue being as crammed as it is, the way it’s presented threatens to undercut the authenticity of his journey from tyrant to pacifist. As Season 1 did, this issue ends with a bombshell relating to both the Transformers’ quest for the Knights of Cybertron and to the origin of the Transformers themselves. But the very last page throws another ill-advised, space-gobbling twist, which feels sadly appropriate. Don’t get me wrong, this is a cathartic, intense finale to the conflict between Rodimus’s Autobots and the Decepticon Justice Division. But I hope that Season 3 is able to restore the balance between plot and character, because Roberts is at his best when he is humanizing these giant metal men, not banging them together. 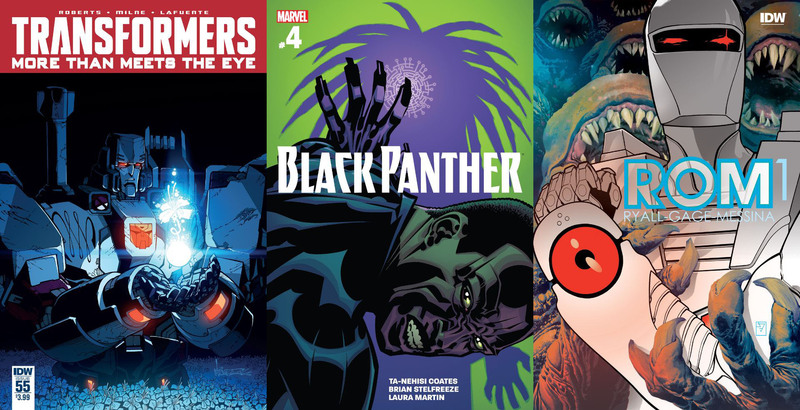 Ta-Nehisi Coates’s Black Panther continues to be one of the more high profile books at Marvel currently, and issue #4 is no exception. Thankfully, it also seems to be avoiding the disastrous gravitational pull of Civil War II that has befallen its peers. The major conflict of BP rests in Wakanda itself, and it’s an introspective take on the usually shiny depiction of the fictional African city. In this issue, Coates takes time to explore Wakanda’s checkered past by introducing the character of Changamire, an old dissident who thought T’Challa’s father T’Chaka’s rule wasn’t progressive enough. It’s very interesting to see Wakanda’s less-than-stellar history with its subjects and borders laid out so bluntly, and Coates gives us no easy answers as to how to fix them. Even T’Challa seems lost as to how to prevent his own people from acts of violent revolution. The strongest characters in this book are, delightfully, women. T’Challa’s mother gives her son a stirring speech about being a leader. Rogue Dora Milaje Ayo and Ayeka remain steadfast in their determination to change the country from within, even if it means conversing with the enemy. Of course, they are being manipulated firsthand by industrialist Ezekiel Stane whose interests still remain quite murky. If Black Panther has a downside, it’s that the comic is still incredibly wordy, but at least the dialogue is impactful and thought-provoking. Stelfreze’s art continues to be serviceable to the story, in particular his use of shadows and light. This book continues to impress every issue, and I think it will make for a solid collection when it’s finished. ROM! He’s back! An obscure but beloved character, ROM is an incredible example of making lemonade out of lemons. Creators Bill Mantlo and Sal Buscema were tasked with writing a backstory around a somewhat generic robot toy, which they accomplished by making him a rogue element in the Marvel Universe, hunting down and killing the evil shapeshifting Dire Wraiths with extreme prejudice. After a several-year run, the character fell into relative obscurity, as ownership issues prevented Marvel from using him. Now, the rights have been bought and the character revived — but by IDW, and thus in the shared universe of the Transformers and G.I. Joe. It’s a strange, winding road, but the upshot is a modern ROM reboot, one that updates the character a bit while staying true to the vision of Mantlo and Buscema. It’s a gorgeous, kinetic comic, with a good mix of action and introspection. Messina and Pasta don’t heavily redesign ROM, much of whose charm is derived from his clunky, imposing design. Instead, they keep his classic look dynamic, throwing him into fun poses and explosive action. ROM is a big robot man who appears and shoots people, and he continues to do what he does best. Gage and Ryall don’t try to reinvent the wheel in terms of ROM’s story, either. The Marvel-based elements of his backstory are gone, but he still seeks to destroy the Dire Wraiths, who have infiltrated Earth. While I’m sure we’ll see plenty of the Transformers and G.I. Joe soon enough, for now they’re content to let ROM be ROM, shouting bombastic threats at his enemies as he disintegrates them. There’s a strong sense of character here, like a darker, violent Silver Surfer. The horror elements are played up as well, with the Dire Wraiths assimilating humans and transforming into monsters pretty regularly. All in all, ROM is a good balance of setup for new stories and callbacks to the original take on the character. The idiosyncrasy of the character is the main draw, and IDW kept that in mind with the new take. It’s an update that places him in a new context but keeps the core character and spirit intact.